I’ve been fortunate during my recent journeys to tick a few travel-related items off my bucket list. 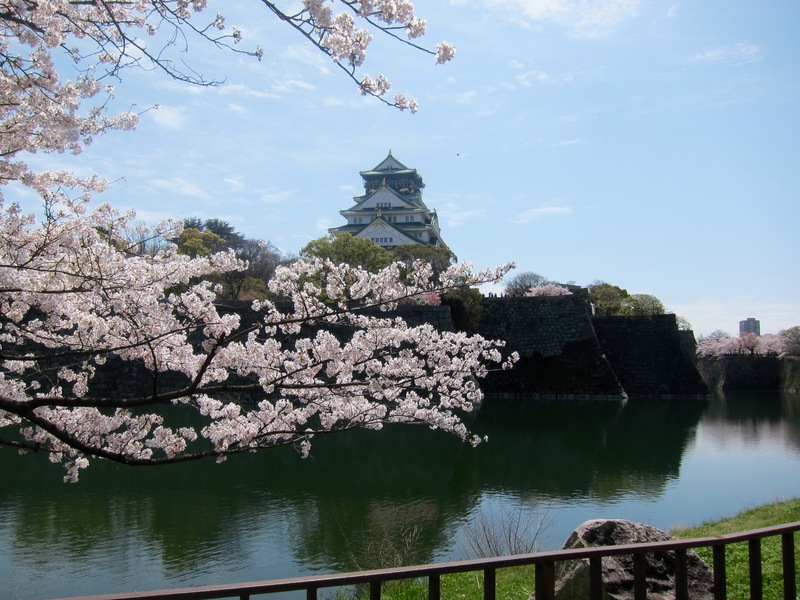 I have always wanted to visit Japan during the beginning of spring and travel the country south to north following the cherry blossoms. For the uninitiated, cherry trees have an extremely short flowering season. The blossoms last for around two weeks at most, or as little as a few days if wind and rain knock the flowers from the trees. Catching the trees in full bloom requires a combination of good timing and sheer luck. 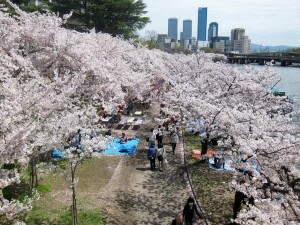 Families gather along the Kyū-Yodo River to picnic under the cherry blossoms. I was lucky enough to arrive in Osaka at the height of the bloom. Even luckier, my timing coincided with the one and only sunny day I’ve experienced since I arrived in Japan. Thank goodness for at least one sunny day to enjoy the cherries in peak bloom. I wandered along the Kyū-Yodo River, which meanders through central Osaka. 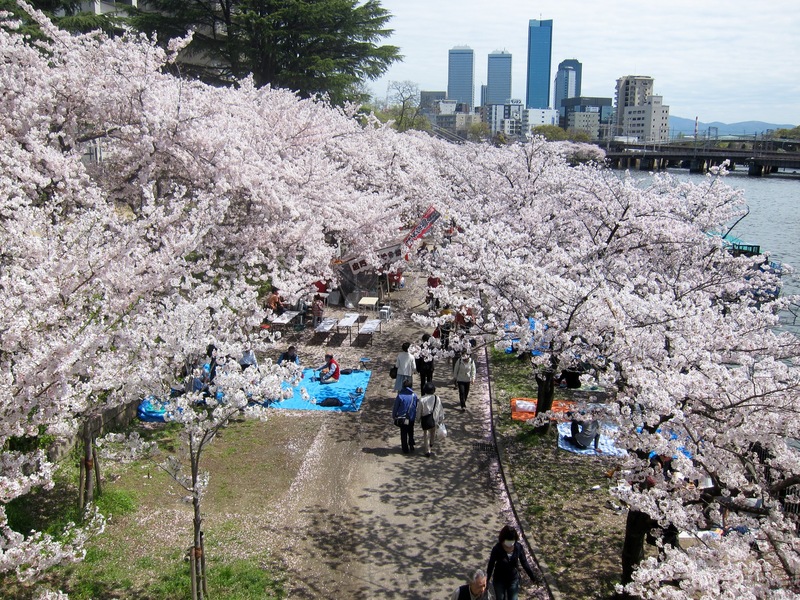 The city was alive with crowds along the entire length of the river; the cherry blossom season is a tourism highlight and the crowds were comprised of an even mix of Japanese and foreign tourists. 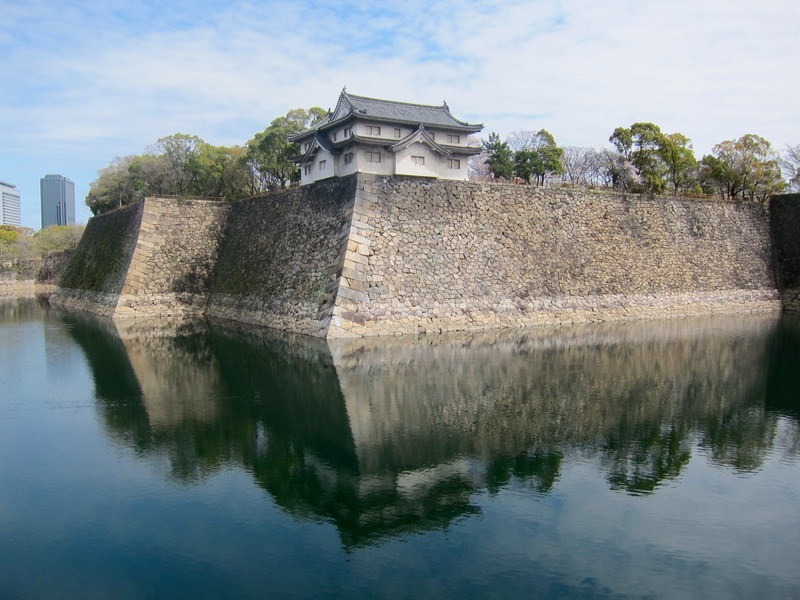 I eventually arrived at Osaka Castle, which is an impressive feat of construction featuring deep moats, cyclopean stonework, and manicured gardens. Cherry trees line the edge of the moats which surround Osaka Castle. Most of the moats were filled with water and alive with fish and turtles, but a few had been emptied with grass grown along the bottom. 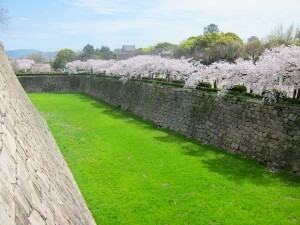 The contrasts of colours between grass, stonework, cherry blossoms and the sky was striking. 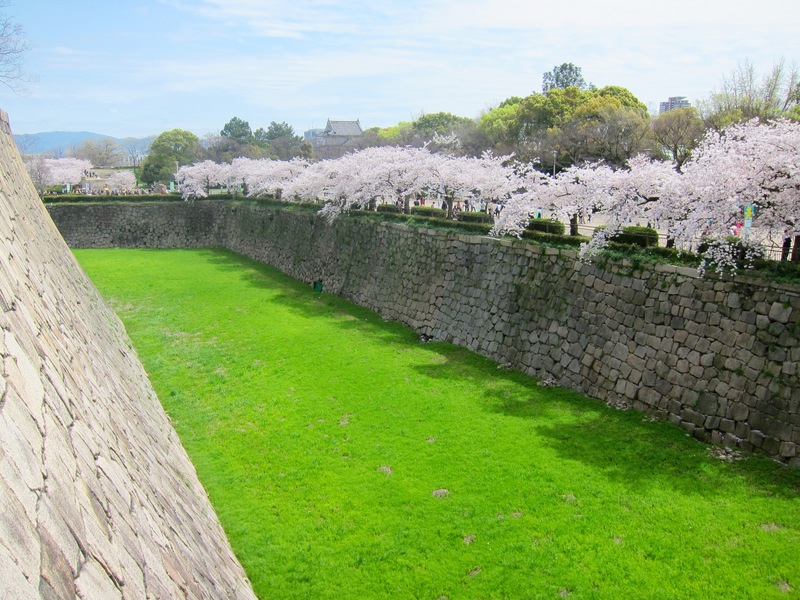 The lawns which line the emptied moats around Osaka Castle provide a striking colour contrast to the stonework, the cherry blossoms, and the sky. 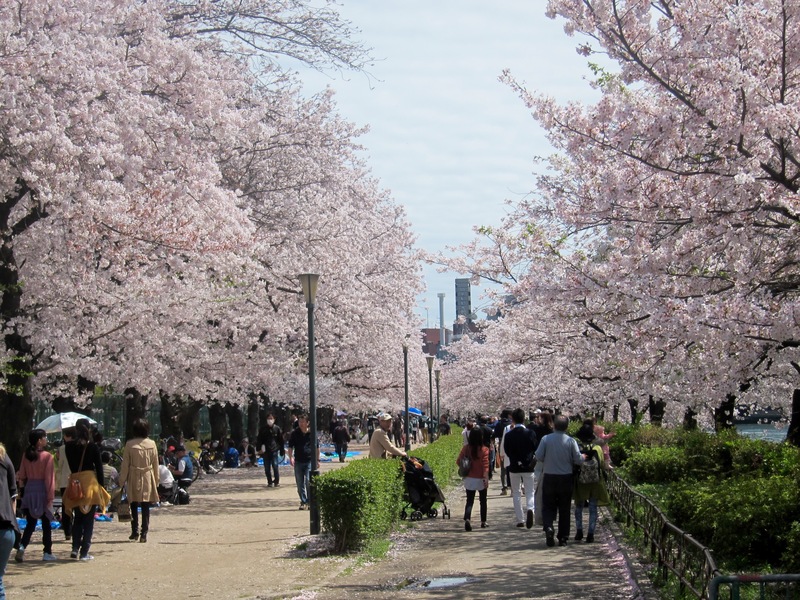 If you want to visit Japan during the cherry blossom season, you can track the latest predictions for “full bloom” here. 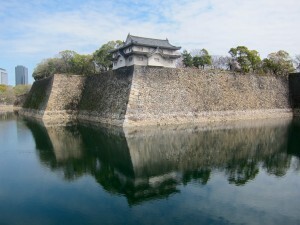 The moats surrounding Osaka Castle are teeming with fish and turtles. I’m so glad that you got one sunny day in. They’re truly not to be missed! Hopefully the weather from today holds out for the rest of the weekend. I saw images of the cherry blossoms in Kyoto covered in ICE this morning! You were so lucky with the weather. Beautiful photographs. 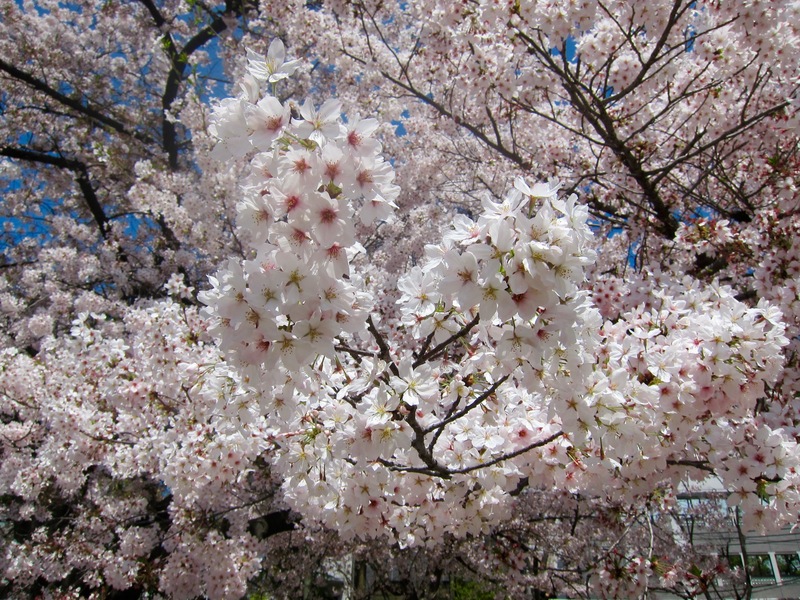 Cherry blossom is always a wonderful sight, but what a backdrop for them! Lovely pictures. Cherry blossoms are indeed calming to look at. Any more letters to come for the Challenge? Cherry blossoms are the prettiest part of spring here. They don’t stick around long enough. The cherry blossoms are lovely. I got the same photo when I was in Korea. They look so pretty on the eyes. Just swung by from one of the Facebook writing groups. Amazing pictures! Japan’s a ways down my list of places to visit, but I’ll damned sure be visiting in the Spring when it does come up in the queue.